Warren Lee Davis was born June 30, 1943 in Atlantic City. Warren attended Atlantic City High School and was the star of the basketball team, playing center at 6–6 for the Vikings. After high school, he got a job and kept playing ball on the side. He was later recruited by Cal Irvin to play at North Carolina A&T on a perennial 20-win team. In his first season on the Aggies varsity, Warren pulled down 381 rebounds to set a new school record. It still ranks third on the school’s all-time single season list. A&T captured the CIAA championship that season. The Aggies won the championship again in 1967. Five players from that squad would end up playing pro ball—Ted Campbell, George Mack, Maurice McHartley, Lonnie Klutz and Warren. Warren had actually been drafted by the Knicks two years earlier because technically, at 21, his class had graduated. Warren stayed to get his degree. In 1967, Warren began his pro career with the Anaheim Amigos of the newly formed American Basketball Association. He led the team in rebounding and shooting percentage, and was third in scoring at 17.0 points per game. The Amigoes were short on talent but long on enthusiasm. Guard Lee Selvage became something of an ABA legend with his love of the new three-point shot. He sometimes pulled up on breakaways to fire up a three. The following season the Stars acquired power forward Willie Wise, making Warren expandable. He was traded to the Pittsburgh Pipers at midseason. He averaged 12 points and 12 rebounds a game playing for another pro hoops legend, Buddy Jeannette. Warren joined his fourth team in as many seasons in 1970–71. The Miami Floridians had done a major housecleaning over the summer and Warren was one of the “good guys” they brought in. The team was built around two superb guards, Mack Calvin and Larry Jones. Warren split time with two other players at forward and was cut loose after the season. Warren felt he still had much to offer a pro team. He wrote a letter to the Carolina Cougars asking for a tryout, listing the ways he thought he could help the team. Coach Tom Meschery gave him a shot and Warren made the club. He shared the front line with Joe Caldwell, Ed Manning and Jim McDaniels. Halfway through the season, he was traded to the Memphis Pros for Wendell Ladner. Because of a quirk in the schedule, Warren ended up setting a record by appearing in 86 regular-season games. 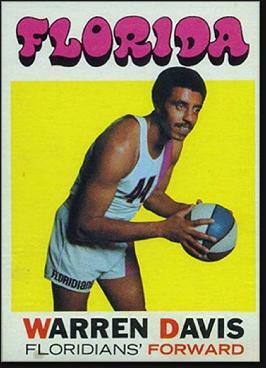 Warren played his final year in the ABA with Memphis in 1972–73 and was out of basketball at the age of 30. His name can still be found in the ABA record books. He is ranked among the Top 20 in career offensive rebounds, defensive rebounds and rebounds per game. His name can also be found in the North Carolina A&T record books—and the A&T Hall of Fame. Warren was inducted in 2003, at the age of 60.